An award-winning pasta dating back to the Middle Ages. One of Italy's most unique and hard to find pastas, La Bella Angiolina Croxetti comes from the Levante area of Liguria, east of Genoa. Where noble families once had the pasta stamped with their coat of arms, our disc-shaped individual croxetti are hand-stamped with images of mortar and pestle, sunsets, or palm trees, creating a light, "open-faced raviolo" that absorbs a wide range of sauces. 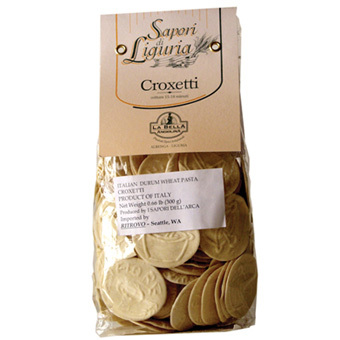 Croxetti are a traditional treat with meat and mushroom sauces, though a fresh basil pesto is an ideal accompaniment. The origins of La Bella Angiolina go back centuries to a Ligurian folk heroine who created locally-based recipes so delicious that she was named "the beautiful little angel." Equally faithful to local traditions while using a deft yet sensitive hand and the best quality ingredients, Luca Bastieri and family recreate traditional favorites in the sun-drenched Italian Riviera. 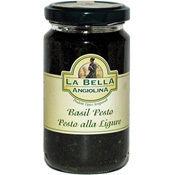 La Bella Angiolina proudly use their own, manually-harvested Taggiasca olives--some picked from trees over 400 years old--along with fresh ingredients from the Italian Riviera to create a varied line of regional delicacies, including savory pestos, condiments, and D.O.P. extra virgin olive oil. There artisan pastas are some of the finest available. These flavors are Italy at its best!